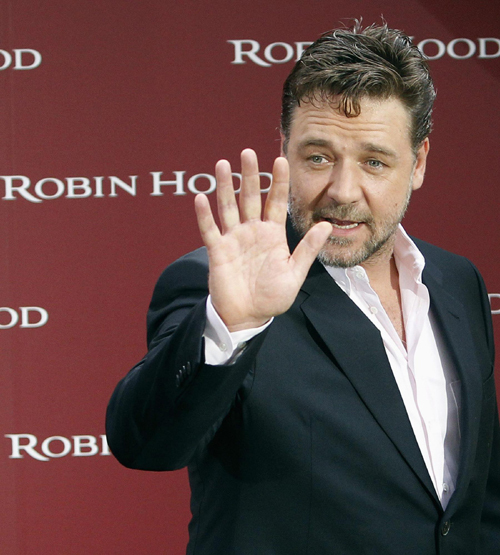 Hand Readings of famous people: Are Mel Gibson and Russel Crowe angry people? Are Mel Gibson and Russel Crowe angry people? Russell Crowe and Mel Gibson are two world famous actors from Australia known for their short tempers. What are the underlying issues in their personalities here? Lack of self-control? Or tantrums because of their celebrity status? Or maybe they are being misunderstood? The hand can tell us the inside story. and short-tempered too. But the similarity is a superficial one. Russell Crowe has tapering fingers and a well-balanced (phalange wise) thumb and Headline. Mel Gibson, on the other hand, has slightly thicker fingers, a thicker and stronger top phalange of the thumb which is also supple and a slightly slim second phalange, and a Headline (unfortunately not that clear in photographs) which is apparently weak after the halfway mark. Check out an image of Russell Crowe's hand here and Mel Gibson's here. Most important, Gibson has a very pronounced Lower Mars mount and this by itself shows excessive aggression. Without a strong Headline it can mean difficulty in controlling the aggression. Combined with the short temper and a willful and impulsive nature, a person with such a hand can be intimidating to anyone who crosses him. But he can be diplomatic when he wants to be. Crowe's hand shows that he lacks the diplomacy and be quite direct, almost blunt. His aggression levels are high but controllable. However, the temper combined with this direct approach can rub people the wrong way. Although his hand shows a slightly mean and cynical side to his nature, Russell Crowe is the more sensible and the more refined amongst the two. He may not like people as much as Mel Gibson does, but he cannot be labelled as an angry person, not if goes by the hand. He is also sensitive, which could cause him to react to even small things. Although he likes the good life, like Gibson, he is more dedicated to his craft and his energy better directed. You might also like Tom Cruise's hand reading or Ben Affleck's Hand Reading or Hugh Jackman's hand reading or Ashton Kutcher or Denzel Washington and Julia Roberts. Or read the hand analysis of all the other Hollywood actors, both men and women on this website. If these people had been in a different occupation, say sales persons in a shop, would they still have carried the same short temper? Or will their job have an effect (reduce) their anger (as that maybe required for a sales person). DI, that is exactly what I was wondering. In the first draft of the post I had even mentioned that but then deleted it because I felt it was my opinion and not really based on any scientific fact. I felt that someone who is in the limelight would probably try to be self contained because of the fear of public opinion. A salesman too would be controlled in the job, but could wreck havoc at home. In their private life if the person feels that it will never be found out, then someone with a short temper who also lacks basic self control would be the same (if not worse because of frustration) whether unsuccessful or successful. I noticed in another more clearer photograph that Mel Gibson's head line on the right hand is sloping towards the mount of moon. Would this still constitute as a weaker head line? I don't remember his hand but generally speaking the stronger headline is one which is only gently sloping. It is the shape which counts. But of course, finally it is the quality and length of the line which matters and also whether it is normally placed or high or low on the hand and how tied it is to the lifeline.